Temperature close to zero? We’ve got fun ideas for you! Frigid weather has hit and schools across the country are closing their doors. But that doesn’t mean your kids can’t be learning today! Turn your house into a science lab with these ten awesome cold weather home science experiments. It’s our firm belief that life’s best teachable moments occur outside the classroom. Here’s your chance to teach your kids that learning never ends! You don’t need anything fancy to do these experiments and we bet your kids will find them fun! Please use caution and common sense when trying this experiment and of course, never let children handle boiling water. 1. Make Your Own Snow Cloud Place a mug of water in the microwave for 2-3 mins and bring to a boil. Quickly (and carefully) take the boiling water outside and throw the water into the air. It will instantly transform into a snow cloud with little to no water ever reaching the ground. 2. 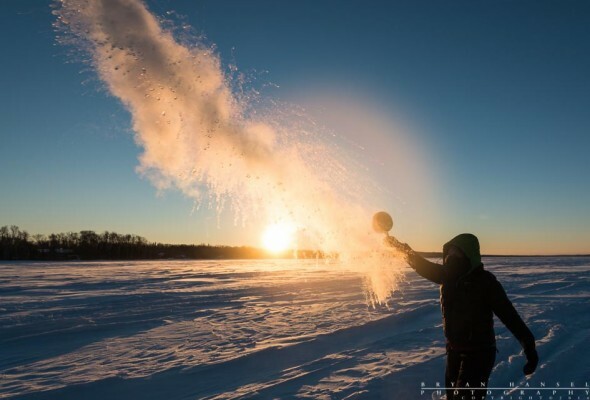 Turn A Water Gun Into A Fog Machine As a variation of experiment #1, place the boiling water into a super-soaker-style water gun. Spraying the water into the outside freezing air will produce an impressive stream of fog. 3. Instantly Freeze A Bottle Of Water Get several unopened bottles of water. This must be ultra-filtered bottled water, cannot be tap water. Take them outside and let them chill to below freezing. This could take up to 3 hours depending on the outside temperature and the starting temperature of the water. Wait until the water has cooled below freezing, but not frozen. If the bottles are frozen, you waited too long. Gently pick up a bottle and smack it. The water in the bottle will instantly freeze before your eyes. Even though the water is below freezing, ice crystals need an impurity to form. The ultra-filtered water has none, until you introduce some small bubbles via the smack. If it does not work, give the bottles some more time and try again. This experiment never gets old. 4. Grow An Ice Sculpture Get an ice cube from your freezer and place it on a surface outside. Get one of the unfrozen unsmacked bottles from experiment #3. Very slowly and gently open the top being very careful not to start the freeing process. Now, slowly pour the water onto the ice cube and it will begin freezing into interesting shapes. The ice cube serves as a seed to start the freezing process. 5. Make Instant Slushies A slight variation on the water tricks. Take a small unopened bottle of a soft drink and shake it vigorously. Leave the bottle outside (again, depending on air temperature) until its below freezing, but not yet frozen. Then, carefully open the bottle and pour some into a shallow bowl. Drop in one or two ice chips and the drink will start to turn into a slushie. Again you will have to find just the right chilling time based on your local temperature. 6. Blow Some Frozen Bubbles Soap bubbles behave very differently when blown in sub-freezing temperatures. Blow some bubbles and watch them quickly freeze. They will pop like balloons littering the ground with their once spherical carcasses. 7. Hammer A Nail With A Banana Take a mushy over-ripe banana, and place it outdoors for a few hours. Now, amaze your kids with your new found fruit-based hammer and drive in some nails. 8. Make Self-inflating Balloons Blow up some ordinary balloons and take them outside for a few minutes. They will begin to collapse as they cool. Bring them back indoors and they will re-inflate to their previous size on their own. 9. Make Ice Globes Use your faucet to fill some balloons with water. Optionally, add a few drops of food coloring. Then place the balloons outside for a few hours. Once frozen, remove the balloons to reveal the ice globes inside. 10. Make Paper Towel Frisbees Use a dinner plate to trace out circles on some paper towels. Cut the paper towels into circles and dampen them with water. Flatten out the discs and attach them to a clothes hanger with a clothes pin or paper clips. Attach at the very edge so that most of towel is hanging freely. Hang vertically outside for 30-60 minutes. Kars4Kids thanks internet technologist Dannie Gregoire for sharing these awesome ideas. Send us those cool shots of your experiments! Next Free t-shirt for a… fan?